Our founder, Phil Sanders, was a textile salesman by trade with a love for Western movies. While living in Dallas, Texas, Phil and his wife Jeanette were inspired to perfect the taste of food cooked over an open flame. Sitting in their backyard, they pioneered cooking chicken on a rotisserie over a wood fire. It didn't take long before their friends and family were lining up for a taste of Cowboy Phil's chicken. Phil and Jeanette were encouraged to open their own restaurant, and in 1981, they did it and called it Cowboy Chicken.<br><br>Although times have changed since 1981, we still believe in serving the same delicious chicken that started it all, hearty and healthy signature dishes and an authentic, welcoming experience centered on the art of cooking over a real wood-burning fire.<br><br>We challenge the status quo by never compromising on the quality of our ingredients. Our chicken is all natural and has no added hormones or steroids. Our dishes are hand crafted daily from only the freshest ingredients. We call this honest food, and it's what keeps our friends and family coming back for more.<br><br>Our recipes have stood the test of time and remain bold, simple and natural. 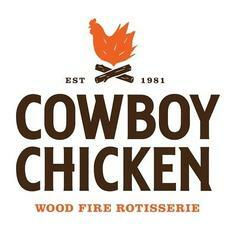 Our wood-fired, hand-carved rotisserie chicken is worthy of the most trail-hardened cowboy. We trust in the things we know are tried and true-our passion for excellence in the food we serve, treating guests like family and employees like partners and sticking to what got us here-food as honest as a handshake.